The EO VAS project will reshape Earth Observation Value Chain by breaking “downstream” component and significantly simplifying development and delivery of Earth Observation Adding Value Services. Project foundation is built around Sinergise’s award-winning (2016 Copernicus Masters Award) Sentinel Hub Operational Prototype (world-first engine for archiving, processing and distribution of Sentinel data) and Geoville’s extensive set of processing algorithms (applied in over 100 existent EO VAS). Main technological novelty lies in cost effective approach, which uses resources only when somebody is asking for results, thus making the services more affordable. Functional novelty is expressed through its connecting characteristics - connecting end-user communities with developers, who can build their services on top of initial toolset and commercialize them through the platform without the need for large investments in processing and storage infrastructure or data processing developments. The project has received funding from the European Union’s Horizon 2020 Programme as part of the Community Research and Development Information Service Programme. Coordinator for the project is Sinergise d.o.o., Slovenia. Main technological challenges, regarding EO processing algorithms have already been solved through past projects and will be implemented into “EO processing part” of EO-Toolset. The majority of NEW software development belongs to Workflow designer, Subscription manager and Publishing manager. From the perspective of programming effort, Processing library, Workflow designer & Workflow Engine represent the biggest parts. Validation should (1) confirm market readiness of EO-Toolset, (2) provide means (Initial set of EO Value Adding Services) to start interaction with end-user community = commercialisation and (3) produce a list of recommendations for the next (post-project) development cycle. Capabilities demonstration through delivering one or more “free-of-charge” demonstration areas where (1) domain-experts can experiment with their EO VAS and (2) end-users can examine the capabilities of Initial set of EO Value Adding Services. Establishing domain-user and end-user education environment (documentation, trainings and workshops). Development of end-user community is deemed one of the most important parts of the project. Establishment of maintenance and support system. Delivering first version of Data catalogue - providing data on EO VAS and data availability. The EO VAS project is intended to provide a new approach to EO VAS generation and public exposure of products and services based on remote sensing, thus fostering (1) development of new downstream services and (2) general user take-up of EO VAS. The project will be executed through the realization of work in four work packages (WP) and three phases (Figure 1). Basic control points (end of phase) of the EO VAS project are milestones. Planned duration of the project is 24 months, starting on February 1, 2017. 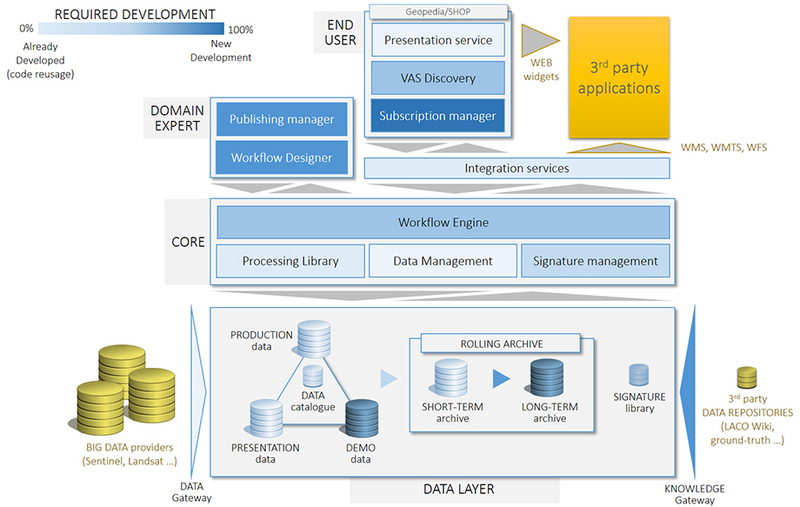 WP2 - Technology development = software programming will deliver EO-Toolset. WP3 - Validation = design of EO pre-processing chains + design and implementation of Initial set of EO Value Adding Services (= validation of EO-Toolset). WP4 – Industrialisation and commercialisation will promote/disseminate projects results and provide all other “background” services, required to enter the market. First virtual market place for EO VAS, introducing completely new business model in the area of EO services = model, benefiting all participants in EO value chain - from data providers, through service providers to end-users. EO VAS innovation hub: fostering development of EO services, becoming a virtual meeting place for the exchange of new ideas and encouraging EO VAS experimenting. Virtual business incubator for emerging earth-observation oriented start-ups, that lack the means to commercialise their EO services by themselves. Pre-processing engine for other EO domain services, helping them to reduce pre-processing costs and to turn their attention into domain expertise and higher quality of their products. Both partners have, during last 10-15 years, developed own commercial products and cooperated in numerous research and development projects, thus forming a comprehensive foundation for EO VAS project. EO VAS project is built around (1) new business opportunity arising from open and free access to Sentinel data, and (2) availability of expertise, know-how and set of existing solutions by both consortium partners: Sinergise and Geoville, both of them highly esteemed and recognised in the area of GIS (Geographical Information Systems) and remote sensing/image processing.